I get so tired of making the same potato salad for those summer cookouts. So this recipe in an old sunset magazine caught my eye. I made it for a church potluck and I was surprised how delicious it turned out. It was a bit spicy but I loved that. It was a big hit. So if you need a new side to accompany you to a summer event, check out this delicious twist on corn on the cob. 1. Heat grill to high (450° to 550°). Rub corn and poblano with 1 tbsp. oil. Grill both, turning occasionally, until poblano is mostly blackened, 5 to 10 minutes, and some corn kernels have browned, 10 to 20 minutes. Let cool. 2. Cut corn kernels from cobs into a large bowl. Peel and seed poblano, cut into 1/2-in. pieces, and add to corn. In a small bowl, whisk remaining oil with lime juice, chipotle chile, and salt. 3. 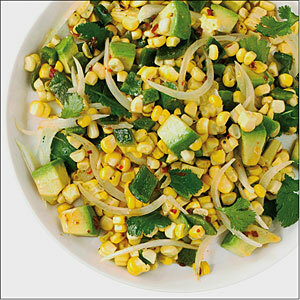 Stir avocado, cilantro, and onion into corn mixture along with chipotle dressing. I realize my posts have been few and far between lately and I apologize to my readers. My hubby has been gone over 384 days in the last 2 years and we are winding down on this last deployment so I have a lot to do and little free time for cooking adventures. Recently we had a homecoming potluck and I was excited to have a chance to rifle through my scrumdiddlyumptious recipe binder, full of recipes I have clipped for future use. Chop chocolate bars, microwave for 1 minute at medium power and stir. Then microwave for one more minute at medium power and stir again, should be melted. 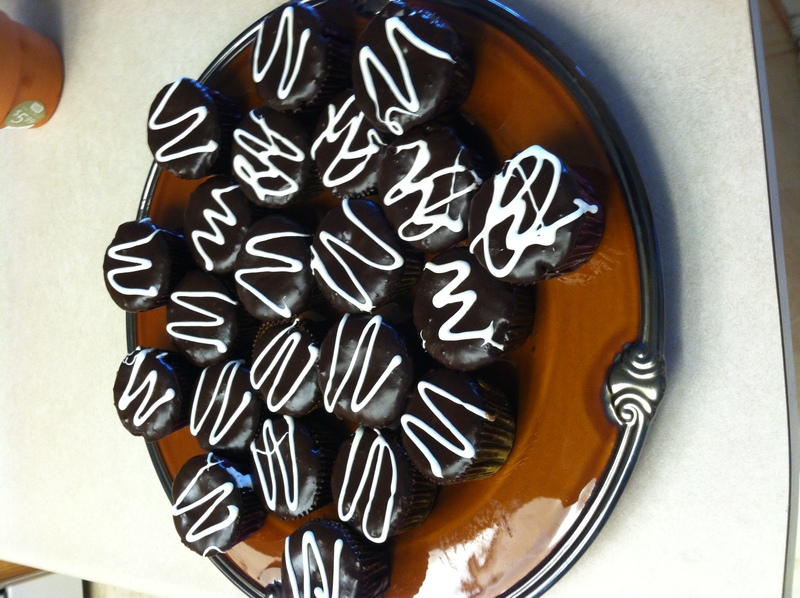 Once cupcakes have cooled, dip the top of each cupcake in this glaze and set upright on a cooling rack. Dip each cupcake 2 more times and let stand until glaze is set, about 1 hour. Using an electric mixer, beat the butter, sugar and salt at high speed until fluffy. Add marshmallow cream and mix at medium speed. Transfer to pastry bag fitted with a small tip and decorate cupcakes with a zig zag design. I am not the best artist when it comes to decorating as you can see from my photo but I loved making these. You could also just make my cake recipe and frost however you like, if you want to try a great chocolate cake recipe. So if you want to make something retro and fun that will be a big hit at your next event, check out my recipe! You are currently browsing the What Tara's Cookin' blog archives for May, 2012.